Produced in conjunction with the U.S. Department of Justice COPS Office, Light in the Darkness - A Guide for Law Enforcement identifies discussion questions and community policing best practices for law enforcement representatives organizing internal agency screenings or community screenings of the PBS documentary film Not In Our Town: Light in the Darkness, which profiles a town taking action after anti-immigrant violence devastates the community. The film focuses on lessons learned from the tragedy and the commitments town leadership and everyday residents make to address the underlying causes of the violence, heal divisions, and begin taking steps to ensure everyone will be safe and respected. The guide also addresses challenges to hate crime reporting and outlines additional resources available to law enforcement for screenings. 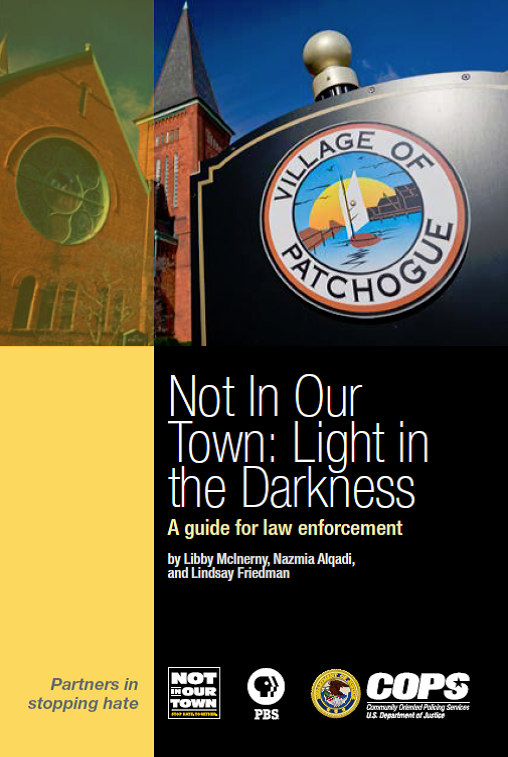 Used together, the film and guide can help agencies initiate important conversations and develop proactive community policing strategies that promote mutual trust, improve hate crime reporting, and address tensions before they erupt into violence. You can download this guide here as a PDF.